1. 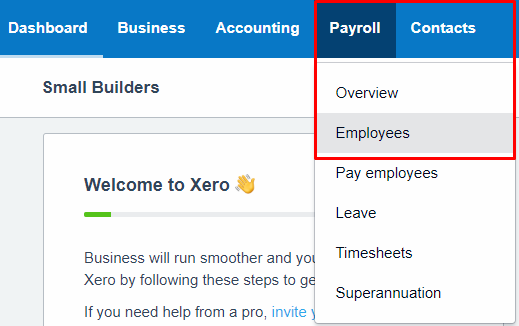 On the right side of your portal, click on the Xero button on the Accounting Software Integration portion. 2. Under Contacts in the Xero tab, choose the type of contact you want to save to your Xero account – Customers, Suppliers, and Employees. 3. Go to Small Builders to XERO tab. What will be displayed are the contacts that exist in your Small Builders account but do not exist in your XERO account. 4. Tick the checkbox of the record you want to save. Note: Reconciled Contacts are your contacts from Small Builders that have been successfully integrated to your XERO account. 6. Check if the person was saved on to your Contacts in Xero. If you have integrated a customer or a supplier, go to Xero > Contacts > All Contacts. If you have integrated an employee, go to Xero > Payroll > Employees. Note: By default, contacts saved to Xero have no contact type (customer or supplier). Contact type will only be identified if the person is involved in Xero transactions.